Many smartphone users both take and display photos pretty much solely on their mobile device, which means there’s room for a easier way to catalog and share those photos apart from the endless river of the camera roll. Enter MyRoll, which used to be called Flavyr: A prettier, smarter camera roll that just could find a place on your home screen. The first thing you notice when you open up the MyRoll app, which is available for both iOS(s aapl) and Android(s goog), is that certain photos are larger than others — it’s not a wall of small thumbnails. There are two primary views: A gallery view, which has an endless river of photos, and moments, which, like the iOS 7 feature, organizes photos into galleries based on time and location the image snaps. But unlike Apple’s implementation, MyRoll draws your eyes to the photos that are most likely to matter to you. 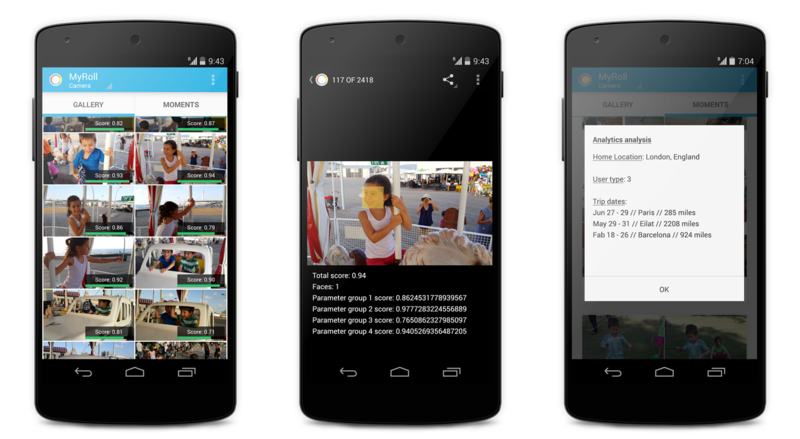 The way MyRoll does this is by predicting which photos are most likely to be interesting. For instance, its algorithm looks for smiling subjects, which a good sign that the photo is probably worth highlighting. If the user swipes or shares a photo, that also makes MyRoll more likely to enlarge that specific shot — so say, if you’re constantly showing friends the same picture of your kid, that photo is more likely to be highlighted. On the other hand, photos that are blurry are less likely to get marquee treatment. MyRoll’s sharing features are also very nice: in addition to being able to share galleries through email or text messages, MyRoll also allows to upload an entire moment to a Facebook(s fb) gallery easily, which is very handy. There’s also an option to create a gallery on a webpage, with a URL that’s easy to share. Unfortunately there is no cloud component at the moment, which is a missed opportunity. Other companies — including giants like Dropbox and Google — are exploring similar gallery ideas, but pairing them with cloud storage, sometimes even in unlimited amounts. There’s also no camera feature, which means you’ll be taking photos with your favorite camera app and then viewing them in MyRoll. Although the iOS photos app now sorts your photos into “moments,” there’s still a lot to be desired in the implementation. MyRoll is a simple solution. Instead of replacing multiple aspects of smartphone photography — the camera, storage, processing — it focuses on one thing: organizing the photos on your device and making them easy to show off. It’s currently available and free for iOS and Android devices.